It was 18 months ago as of this writing that I first published my very rough plan to achieve a Net Worth of $10M and $50,000/month in income. When you put together such an ambitious plan that stretches over a 20 year period, you have to expect things to evolve. This post is my attempt to first give a status update as to how I did against year 1 of the plan, and to also give an updated blueprint that is based on new information. Believe it or not, but a lot can change over the course of 12 months. To put things in proper perspective it probably makes the most sense to review the original plan from a high level. 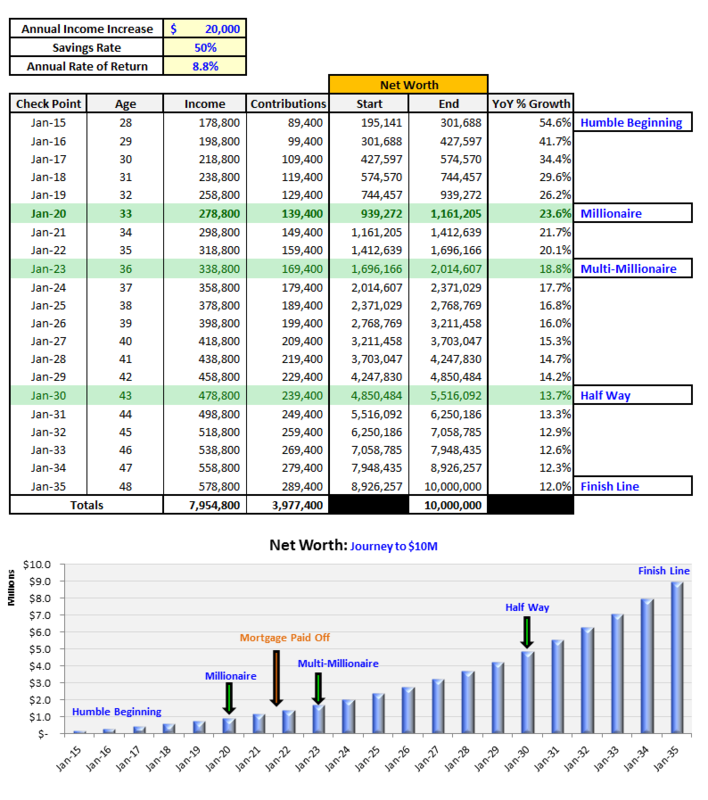 1 – Starting Net Worth was $195,141 as of 1/31/15. 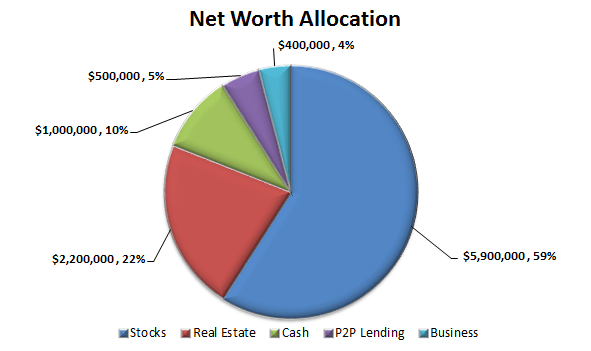 2 – Net Worth Composed of 5 Major Categories: Stocks, Real Estate (including primary residence), Cash, P2P Lending, and Business. When I first put this plan together in January of 2015 I was actually forecasting a drop in income. You will notice from the table above that I had forecasted income of $178,800 and net worth of $301,688. A lot of good things happened in 2015 that weren’t even on my radar. You may recall the email I sent to the CEO that landed me a promotion to director and a $60,000 increase in comp ($30K increase in salary and $30K increase in bonus). This helped us blow our income goals out of the water, bringing in $254,359 in 2015, which is well ahead of schedule. Our investment returns were not anywhere close to the 8.8% we needed, but the increase in income was able to more than make up the gap. Our equity portfolios returned 4.6% and our real estate returned less than that. The blueprint called for a 2015 ending net worth of $301,688 and we finished the year at $317,727. I originally set this blueprint up aiming for a 50% gross savings rate (I report our savings rate net of taxes, which we are just barely hitting 50% this year. On a gross basis our savings rate is closer to 37%, so this will make milestones harder to hit until we can achieve a 50% gross savings rate). The $195,141 starting point was actually the January 2015 ending net worth figure, instead of ending net worth at December 2014, which should be $181,364 (just wanted to point that out, as I fixed it in the updated table below). I also never assumed an allocation for Gold, which has since changed. Today it makes up 1% of our net worth, but the aim is to work that up to 5% over time. 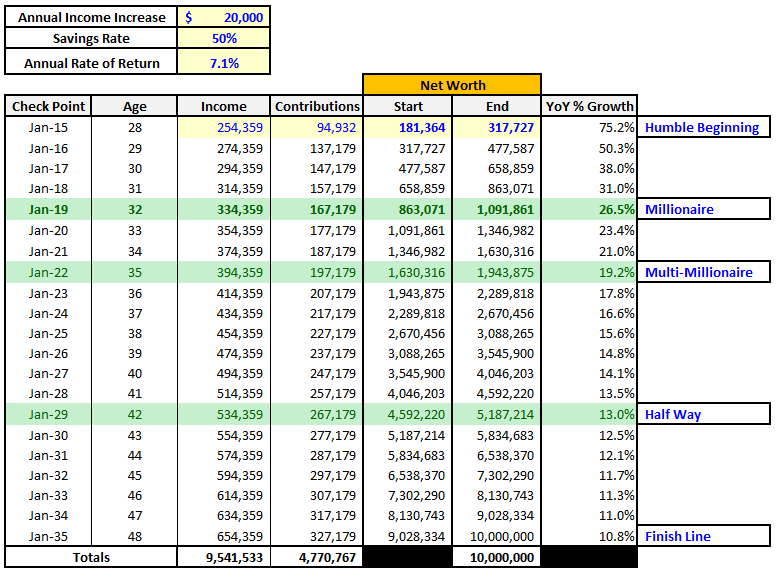 Overall, we’re on track, but since so many things have changed pretty drastically, I thought it would be worth updating the model with the 2015 ending numbers (income & net worth). For the most part, when I updated this model with the 2015 ending figures, I let everything else just flow through. I had to re-run the goal seek in order to see what the compounding rate had to be in order to achieve $10M within the 20 year time frame. In doing so I was pleased to discover that I was able to adjust the required return down from 8.8% to 7.1%. This return seams much less daunting then the 8.8%. You may notice that I have not fully updated our expected income. If you have been keeping track from the monthly financial reports, you will know that we are on track to gross about $315,000 this year. On top of this I have a very big promotion coming later this year that will continue to help us blow those income milestones out of the water. This updated blueprint has set a new target for year two of $477,587 in net worth by the end of 2016. We will be over $400,000 for the first time in July, but this will be a stretch for sure (my latest forecast has us ending the year at $460,000). Working to increase our savings rate to 50% of gross income (we are projected to be at 38% for 2016). Just to clarify, I currently track and report our after tax savings rate, longer term we are working to realize a gross savings rate of 50%. Mathematically it just isn’t possible right now, especially in light of the fact that the majority of our income is earned income. We will need a pretty massive shift in passive income (lower tax rates) in order to get this closer to 50% of gross. We all need stretch goals. And to continue making investments. Since updating the model the portion of the $10M nut from contributions has increased from $3,997,400 (or about 40%) to $4,770,767 (or about 48%). We are crushing it on the income and saving side of the equation, although we do have work to do in order to increase our gross savings rate. We can’t control the returns we get on our investments, all we can do is keep making smart investments. The good news is that the rapid growth of our income is helping to make up the gap for investment returns and a lower than assumed gross savings rate. We never know for sure how we will reach our goals exactly, but having a rough plan does something amazing. It gives your subconscious mind the milestones it needs to constantly be working in the background to feed your conscious mind the information it needs to reach those goals. I know that there will still be plenty of twists and turns over the remaining 18.5 years left on this plan, but in the same breath, I have no doubt in my mind that we will reach our goal of $10M on or before our goal date of December 2035. My only advice to you is to start planning and taking massive action towards your goals. Your numbers are on fire! Psychologically, I can’t imagine myself being in the millionaire club, but I want to be in the millionaire club and am working every day towards that goal. Saving over 50% of my income, now I need to work on adding additional income to the equation to get there faster, which is why I like your blog, Reducing expenses is finite but adding income is infinite! Hey Finance Solver – You can definitely make it to the millionaires club. Sounds like you have a robust savings rate already, so working on the income side of the equation is going to be the best tool to get you to the double comma club the fastest (in my opinion). The sky is the limit my friend! Your high net worth goal makes your blog stand out and why I love it! My short term goal is to hit $1M but I do want to be in the multi-millionaire club eventually! Julie – glad the goal stands out and resonates with you. What is your target date to reaching $1M? Watching you over the past year has been cool. Around the same age but very different career paths. I project your numbers will pass me in 2017 and the gap widens from there. It goes to show you can buck conventional wisdom. Many say that by saving early you can do well because compounding is on yout side. Well when you are saving/investing 200k in a year it doesn’t really matter what your investment returns are! Jason – Thanks for stopping by. You mentioned we are similar in age but with very different career paths…what do you do? I work in Manufacturing on the engineering side. Total Comp wont really touch the finance industry. I started off out of college with mid 60’s salary (fairly high for starting out ) with no debt and investing immediately. (2009) Those two things really helped get off to a good start. Now have a child so those expenses come directly out of all the cash was that getting invested. But as I said earlier. you are doing well on the income side which you are smartly investing instead of spending. Have you heard of the millionaire next door formula? It might be a cool post to overlay that on top of you goal. I love the ambitious goal! I agree, the 7.1% may be a bit more realistic of a long term growth rate in your retirement accounts than the 8.8%. But like you said, it isn’t something you can necessarily control, so hopefully it ends up exceeding your expectations. Glad to hear you are more than offsetting this by increased income. With your new position, do you have any guidance on future pay increases or potential income over the long term? Just curious what analysis has gone into your $20K assumption for increased pay annually. Thanks and keep up the good work! TGS – First the $20K assumption at the time was a number that historically we have been able to meet or beat every year (on average) since graduating college. The new position does not kick into effect until the end of the year. At this point I know that my base salary is likely to increase by about $100K and that as long as we continue to grow my bonus will continue to grow as well (it’s a % of total bottom line). Let’s assume that my base does increase by $100K, that would put my base pay at $225K, and based on pay across our senior management team I believe it has upside to $400K over the next 5 years. Cool way to analyze things. It’s great knowing there are so many different levers to pull to get to the same end goal. Unlike you, my income has only steadily be increasing. However, my investment returns are really what is keeping me going full steam ahead at the moment. My stock holdings are up 27% YTD which is simply phenomenal, that’s one benefit to doing what I do for a living, I get paid to study the markets 12 hours a day. I certainly don’t expect this to continue, however I do have a 6 year track record now of drastically out performing the market, all with boring plain blue chip stocks and a little financial engineering. My real estate holding has also increased by about 30% this year, which when combined with leverage of my only 10% down payment, this is about a 300% return for me this year from the real estate side. I’m going to need to start focusing on the income side for a bit as I know these investment returns aren’t forever replicable, though I do intend to continue outperforming by about 300-400bps on an annual basis. Hey Sean – I probably get a bit OCD tracking all this stuff, but it is the only way for me to stay on track. If the career (and associated comp) was not moving so fast, I would spend more time on the investment side, but right now the highest and best use of my time is in the day job (believe it or not). Your returns are incredible! Especially the RE return. 2017 will be the year I put more focus towards investments (see if I can get returns anything close to yours). Blog is just too inspiring to read, you crushed year 1 goal.i will be following your blog more . I love your use of spreadsheets. Keepin’ the Excel game strong! That’s probably one of my favorite things since joining the PF community – seeing so many other people obsess about spreadhseets! Huge changes to the model since you are crushing it! The gross / net savings rate is very significant and I agree it doesn’t sound possible. Although, you could set the goal to keep your spending the same for the next ~2 years and your income growth will help you eventually get there. Then once you are at 50% gross savings, you can increase your spending from there. Keeping spending flat, while income continues to rise, will help a lot to get to a 50% gross savings rate. It seems that we have found a expense level that we are really comfortable with at about $115K/year (after you deduct out amortizations). This is what we spent in 2015, and are currently on tract to spend about $110K this year. In 2017 we have a few more home improvement projects planned, but then our house will be where we want it, and that will free up another $10-$15K a year as well, which will make staying at the $115K/year even easier. We have made good progress to our after tax savings rate. In 2015 we finished at 42%, and are currently on track for 51% this year. I absolutely acknowledge the fact that gold does not produce cash flow, as is really only a store of value. I agree that rental real estate is one of the easiest ways to produce passive income, its more of an insurance in the event of a run on the banks. We live in interesting times with massive financial experimentation in monetary policy, that none of us know the unintended consequences of. I am not a dooms day kind of guy, but I feel compelled to have this as an “just in case” allocation. Fiat currency doesn’t have a good track record of lasting forever. On the topic of rental real estate, I of course still see it as a desirable place to be. We really do want to pick up another property, but the timing just has not been right for us. That’s why we ended up getting into the hard money lending recently. My wife is also still pretty skeptical of going out of state, she and here family are in the real estate business, and they have a pretty strong home turf bias. Obviously, the cash on cash returns are far less than what you can get out of state.